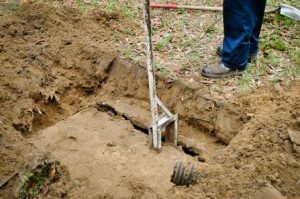 Which Soils Are Best for Septic Tanks? The soil that is used to create the drain field for a septic system and the soil that surrounds that drain field needs to be able to disperse the effluent that is created within the system itself. If this soil is too dense, the effluent won’t be able to pass through it easily so that it can be dispersed. It can lead to drainage issues down the line. Conversely, soil also shouldn’t be too loose, since that can lead to effluent passing through it too quickly and contaminating water in the area. The density of soil is a very important factor. While there are some exceptions to this rule, a soil’s color will often indicate how well it can drain effluent and water. Soil that is brightly colored is usually a lot better at providing drainage than soil that is dull and grey. Before installing a septic tank, a septic company will usually analyze the color of your soil to see how well it would potentially drain effluent and water. When you examine the soil in a yard, you will typically find that there will be a structure to it. Similar types of soil will come together to form what is called a ped. A ped forms naturally and is a combination of particles that can help to promote the movement of water and effluent underground. Soil that has this type of structure is usually better for septic systems than soil that doesn’t maintain any structure. Before you have septic tank installation done, you need to make sure you have the right kind of soil in place. Carolina Septic Pro can help you throughout the installation process and speak with you more about any concerns you might have about your soil. We also offer a range of other septic system services for those who already have septic tanks installed. Call us at 704-626-6622 today to set up a consultation with one of our septic tank professionals.